When your personal budget is really tight, it can be really disheartening to try and cut your expenses but not be able to cut them back far enough. What most of us don’t realize though is that the chances are good that we have more money than we think to spend. Money that we’re currently spending, but we’re so used to having the money go out as an expense that we don’t even consider cutting them. I call this budget fatigue. Trust me, it has happened to me more than once and usually it’s a pretty big face palm moment when it finally clicks. For a lot of families, the expenses that can be cut are usually the ones that are very easily overlooked. They can be things that only pop up once every few weeks or months or they can be things that we’re so used to paying for that we can’t “see” another way of doing things. 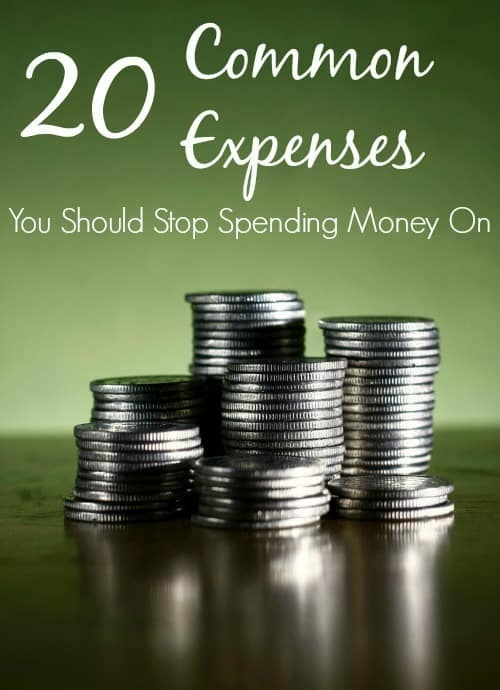 These 20 common expenses you should stop spending money on are just the tip of that iceberg. They’re a good place to start and once you get this particular ball rolling? The rest gets to be quite easy. Sometimes though, your personal budget will fail and there isn’t much you can do about it. A lot of the time, that budget failure is caused because you just simply don’t have enough income coming into your home. Unfortunately if you’re in that case, no amount of cutting expenses will fix it completely. It will help, but the plain and simple truth is that no budget can be successful unless there is enough money to cover the expenses within it. Don’t let that stop you from cutting your expenses though. A budget with the expenses cut takes a lot less to fund than one that is running wild with the unnecessary. If your budget is extremely tight, you might need to look at adding extra to it. That sounds hard, but really it isn’t when you look for different ways. You could find ways to earn free gift cards then use them to pay for things instead of cash. I personally add over $225 a month in income using nothing but my phone and computer. Don’t want to make part time money? Why not start a blog to make money blogging? Yes! You really can make money blogging if you take the time to learn! How much? Check out my 2016 Blog Income Report. When you read this list, keep in mind that these expenses will be different for everyone. This list includes everything from making your own homemade cleaner recipes to cutting your own hair. For some people, they’ll be over the line and things that they would never ever consider doing. For some though, they won’t be enough. My advice to you is that you pick and choose which ones will fit with your own lifestyle and just skip over the ones that make you uncomfortable or that are over your own personal frugal line. It’s okay if one or more of them are. At the end of the day, it is your home and your budget. Cable – If you’re still paying for cable, you may want to ask yourself why you are still content to waste hundreds of dollars each month on a service that you can get much cheaper or even free. These days there is no reason to pay much for tv and movies at all. There are a lot of places to watch tv online for free and Netflix, Hulu Plus and Amazon Video are all great options for what you can’t find free. None of them cost over $15.00/mo (individually) which means you can do all three for less than what you’re currently paying for cable. Plus, when you sign up for a Netflix account, you’ll score 14 days free. Sign up for a Hulu account and they’ll give you 7 days free. Sign up for an Amazon Prime account and get 30-days of Free Amazon Prime and all of it’s benefits (including Amazon Video). Bagged Ice – A long time ago, in a galaxy not so far away, some guy sat on the back of his truck trying to figure out a problem he was having. He needed to transport ice to the lake to keep the fish he would catch that day cold and keep them from spoiling. Looking around, he spotted a large bag and an idea – and a millionaire – was born. While I don’t know if that’s how it actually happened, but if you’re paying for bagged ice? You’re flat out wasting money. Instead of spending $2.00 or more per bag, buy ice cube trays and make your own. If you really absolutely want it bagged? Use a ziploc bag. Bread – It’s much more cost effective and healthier to make your own bread than it is to buy it. Yes I realize that you can buy it for around $0.88/loaf at Walmart. Homemade bread is still much cheaper. How much? Around $0.44 per loaf cheaper depending on where you live. The biggest reason that people don’t any longer is that it takes so long to do. That’s an easy fix if you buy a bread machine to help. Grab a jar of bread machine yeast and find a great homemade bread recipe to start. It takes about 10 minutes to get a loaf in the machine to get it started. Two hours later, you’ll have a delicious, homemade loaf of bread that didn’t break your budget. Haircuts – How much do you spend on haircuts each year? If you’ve got a family, it could easily be several hundred per year at $20.00 per haircut. Why pay that when you can learn how to cut your kids hair on Youtube and buy a pair of hair clippers for much less than you’ll spend at the barber or salon? If you’re concerned that their hair won’t look great, get a few dolls at the thrift store and practice on them before you do the real thing. Fabric Softener Sheets – Dryer sheets are great, but they’re super bad for your dryer and honestly they’re quite expensive. That’s why one of my favorite homemade cleaner recipes is my homemade fabric softener sheets. They’re made from old t-shirts which means that they’re incredibly cheap to make and they’re reusable! Window Cleaner – Why pay for the blue stuff when you can make your own window cleaner for much cheaper? Homemade cleaner recipes use much simpler ingredients which means that they’re easy to make, quite a bit cheaper and much healthier for your family. Laundry Detergent – Like the dryer sheets above, laundry detergent is much cheaper to make at home than it is to buy. You can make your own powdered laundry detergent for pennies on the dollar and it works so much better than the store bought stuff. If you would rather have liquid, make a homemade liquid laundry detergent for just as cheap. You can even make your a homemade Castile soap recipe to help lower the cost even more! Pasta Sauce – Don’t get me wrong; I love a good pasta recipe, but I hate the cost of jarred pasta sauce. That’s why I stopped buying and started making my own homemade pasta sauce recipe instead. I love that I can customize it and add meat only when I want, that I can skip it if I want, and that I can can it up to preserve it. What’s better than jarred pasta sauce? Homemade jarred pasta sauce! Deodorant – Deodorant is a necessity for most people, but there’s no reason to keep buying it. Instead, make a homemade deodorant recipe that I guarantee you’ll love. They’re simple to make and cost effective in the long run. Plus? Most homemade deodorant recipes are all-natural which means that they work well and they’re better for you. Air Fresheners – Why buy a can full of toxic chemicals when you can use fruit peels to make a homemade simmering potpourri. Not feeling fruity? Baking soda, placed around your home in bowls, will do the job just as well. If you need some heavier hitting power, make your own Febreze instead. Expensive All-Purpose cleaners – Buying commercial cleaners can not only get really expensive, but it opens your home up to harmful chemicals that can cost more in doctor bills if you happen to have a reaction. In reality, you need very few items to clean your home. I personally use a Lavender Lemon All Purpose Cleaner that costs me just over $1.00 per batch to make. If you want something that disinfects as well, you can make a homemade disinfectant wipes instead. Drying costs – Your dryer is the single most expensive appliance that you own in more ways than one. That’s why there are so many reasons to line dry your clothing. Is the weather warm? Keep the dryer off and use an outdoor clothesline. If the weather is too cool, you can use a portable drying rack instead. You’d be surprised at just how much you can save this way and this is one way to save that you’ll notice from the first month. Paper Towels – Not only are paper towels bad for the environment, but they can be really bad for your budget too. Instead, pick up some unpaper towels and you’ll save over time. We made the switch to herringbone weave kitchen towels about a year ago and we haven’t regretted it a single time. We’re paying less and they work just as well, if not better than the disposable ones we used to buy. I picked up 24 total towels to start myself off with and haven’t had a single issue. Also, one of my favorite ways to use old towels is to make cleaning rags with them. Feminine pads – Instead of wasting money on disposables, consider making the switch to cloth feminine pads. It might sound bad, but I promise you it really isn’t as bad as it sounds. When you make the switch to cloth feminine pads, you actually will end up with an added bonus that you didn’t expect. Shorter and easier cycles since you’re putting fewer chemicals near such a sensitive area. My favorite place to get them is Tree Hugger Pads. They’re affordable, well made and after two years of using them, I can say that they hold up very well. Diapers – If you’re wondering if you can save money with cloth diapers, the answer is maybe. For the majority of people, cloth diapers will be a way to save, but for some they won’t. Take a few minutes and do a bit of research on the reasons for new moms to use cloth diapers and the reasons you might want to use disposables. If y ou do decide to go with disposables, make sure that you request free baby samples whenever you can. You’ll need them to help offset the cost of disposables. New printer cartridges – If you have a wireless HP printer, you’re in luck because HP offers the HP Instant Ink program to help you save money on printer ink. With this program, you can keep your ink cartridges filled for as low as $2.99 a month. If you don’t happen to have a wireless HP printer, you can still save by picking up an ink refill kit instead. Yes, they can be messy, but if you take your time filling them, they can save you hundreds over the course of a year. If you have a laser printer, you’ll really want to look into toner refills. The savings that you’ll see will be well worth the time it takes to fill them. Chocolate Milk – I love Kroger brand chocolate milk, but I simply can’t justify the cost of it when I can make it myself. You’ll pay almost twice as much per glass buying pre-made chocolate milk than you would if you just bought the syrup or chocolate drink powder and mixed it yourself. Want to take it a step further? Make your own chocolate syrup. Gym Membership – You have an outside? Use it instead. It tends to be pretty free most of the time. Talk a walk, ride your bike, go hiking or even head to your nearest beach and go beach camping. It is all physical activity and will help you to get fit on a budget. Sweet Tea – Stop wasting money on Arizona and other bottled teas. Instead, Ggab a pitcher and some sugar and make it yourself. I use an iced tea maker to make it easy on myself so that I can make a larger pitcher all at once. It’s less tempting to pay for drinks if I have a pitcher of tea in the fridge. Frosting – If you’re baking a cake, you’re wasting money by picking up the canned stuff. Most frosting recipes can be customized by adding an extract to get the flavor you want so all you really need is a good base. When I’m looking for a cream cheese frosting recipe, I use the one that is used in my Pumpkin Roll with Cream Cheese Filling recipe. It doubles very well as a frosting. For buttercream, I use this buttercream frosting recipe. They’re both fantastic recipes and mean that I don’t have to spend money on the canned stuff. I’ve definitely got to try some of the other items on the list— disposable products like paper towels get on my nerves with the cost for sure. We already do a lot of those. The single biggest savings? We haven’t made a car payment since 1994. We only buy used vehicles, for cash. I currently own a 2003 Montana that’s in pristine condition right down to the leather seats. Paid $6,000 for it with 72k back in 2010. Just regular maintenance. Also we only eat out one time per week, (never fast food) Saturday dinner. I make sure we have a coupon or other promotion to discount the bill. For special occasions we will go somewhere really nice and order off the starter menu. It’s the same food and we can never finish the full meal anyway. We just bought a 2005 Kia Sedona for 1400 dollars. Even if we buy another one every single year, it’s still cheaper than a car payment. With good maintenance, we can drive for quite a few years before having to replace it. I wager we save about 20 grand in car payments in 5 years just by being content with an older but still nice vehicle that meets our family’s needs. I like posts like this that make you re-evaluate what you are doing. I switched to a menstrual cup. Thanks for posting. Hello from Thrifty Thursday. I absolutely LOVE the Diva Cup! No more waste to fill the trash cans and landfills. One of the best purchases I’ve ever made! Great list! I’m trying to eliminate all disposable items by replacing them with something reusable when they run out. Switching from paper towels to rags, paper napkins to cloth napkins, etc. Cheaper and more eco-friendly! Hi! Found this on Pinterest and was like “Hey! This might be a great blog to start following!” I started going through your list until it came to the pads. Ahhh. No. I would rather not eat for a day and use that $ for tampons than do that. It just seems a bit unrealistic. As a teenager, my mom reminded me that there was a time when disposable feminine products were not on the market (like when she and her mom and her mom before that were teenagers); so she taught me her methods. I thought her ideas crazy, but now am grateful for the information. I’ve been using them for over 2 years now… Reusable pads. I also have a cup, but prefer the pads. I used to break out every month from reusable pads… And I would dread that time of the month. Since switching to reusable.. It’s so much easier… And etsy has all sorts of designs… Shapes and sizes and I swear they work better. I also make my own toothpaste, laundry detergent, cut my own hair and my husband’s and we utilize our crock pot for dinner at home. We do most of your list… But also do prepaid phone plans and pay cash for our phones up front. That’s awesome Celeste. On the phones, have you see THIS post that I did? It’s not prepaid, but we’re actually saving MORE with them than we were with prepaid. Rose, try the Diva cup! It’s expensive at first but you save SOOO much in the long run! I agree with you 100% Rose!! I like this list! I especially like your points about making your own pizza and sweet tea. We have gotten so lazy when it comes to pizza; we often just buy frozen pizza or splurge for papa murphy’s. We definitely have room to improve here. One thought I have about cloth diapers: we live in a rental and have to pay for every load of laundry we do. I am not sure that we would end up saving that much. What are your thoughts? Portia, I would weigh the cost of washing the extra laundry versus the costs of disposables. You may find that it actually is cheaper, but it will all depend on what you’re paying per load of laundry. You could also look at picking up a portable washing machine that hooks up to your sink for diapers too. Great post.The only one I could do is the bread. Too hot at the moment but last winter I started making my own and hope to do the same this year. One thing I need to eliminate is buying an ice-cream each time I go shopping! Save money and good for my weight! Great advice! I do most of it already. 🙂 Take the chocolate milk a step further and make your own chocolate syrup. Awesome Pat! I’ve never tried making my own chocolate syrup but its on my list of things to definitely do! I make my own chocolate syrup and my family prefers it to store bought. I think the flavor is so much better. I bought a kitchen aid stand mixer on sale online and it was the best purchase ever, I rarely buy bread, sometimes for convenience – like before/after travel, but I don’t bother to freeze my homemade bread). Anyways, I’ve been making beautiful mashed potato/roasted root veg. breads, buns, cakes and pizzas etc. it cuts down on the work and dishes so I look forward to baking/cooking. I would add make your own yogurt to this list. I spent $28 on a yogurt maker and a nut milk bag. This allows me to make amazing greek yogurt at home for the price of whole milk. I save the whey that is strained out and use it for smoothies or in baking. I can get the equivalent of 2 24 oz tubs of Greek yogurt from a gallon of whole milk, with a little milk left over. Great idea! We have making our own yogurt on our list of things to do soon! Even better on the TV one you did is to just get the basic stuff and quit paying for the premium stuff. Find better stuff to do with your time. We buy used cars, cloth napkins from thrift stores, cloth diapers, make homemade pizza in double batches (freeze one for next week), homemade snacks and whipped cream and I’ve been making my own laundry detergent for three years and will never go back to buying it. I can’t imagine the amount of money we have saved just on the laundry detergent us we hang dry as often as possible. Also find great deals at the dollar store most times I can find soap deodorant shampoo toothpaste and toothbrushes mostly brand name too. Also pick up the Sunday paper at the dollar store for great coupons. A ling with boxed foods. Alicia, the dollar store can be great! For us though it’s cheaper to make all of that ourselves since I am sensitive to the chemicals that commercial products contain. We end up spending far more on medical bills than we do to make the items. We went to habitat for humanity and picked up a meat slicer for $10 and an ice cream maker for $5. Now we make our own sliced deli meats and splurge in ice cream at home. No more running to Tim horton’s for an ice cap either. We take our old coffee from the a.m. with milk & sugar and make our own iced coffees! The price of deli meat is so expensive nowadays… 2 packages of salami for pizza was $11. So we bought a whole one that we can slice with our slicer. It can also do veggies, and bread as well! Soon we’ll be making our own loaves at home! Here’s another tip: buy whatever is in season for produce, and then freeze it. Fruits can last for ages in the freezer. Locally grown tastes better too. Not only are you saving money but you help the environment by saving gas because transportation of those exotic fruits n veggies is not cheap!